This meat loaf isn’t meant to replace your dogs’ food—I’m not a canine nutritionist. I’m also not militant that you should cook all meals for your dog. I don’t cook all meals for our cats and dog. I do fix a version of meatloaf for Saffron, our dog, for a few of reasons. 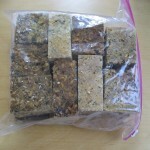 First, is to supplement her dry food with fresh, unprocessed food. Second, is to make Saffron’s food more appealing to her so she’ll finish her food–she’s never been good about eating, especially if she’s anxious. Third, this is cheaper than buying high quality canned food. It’s easy to make, especially if you do it over two days. I recommend prepping all the ingredients first and then mix & bake it another day. I’ve been doing big batches, so I don’t have to do it as often, but I’m not sure it’s worth it since it can be a pain dealing with such large quantities. 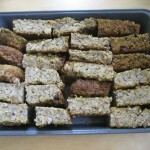 I’ve adapted this recipe from Mabel’s Muttloaf. You can divide the recipe if you want to try a smaller batch. Like with regular meatloaf, ingredients & amounts don’t have to be exact—my ratios are based on the 6 lbs. packages of ground turkey you can get at Costco. Meat loaf is a forgiving dish and even if you’re not an experienced cook, you can make this. You probably won’t need to go out and buy a bunch of ingredients. And if you do need to buy some things, you don’t need to buy fancy ingredients. This is a great chance to use up leftovers, the tail end of a bag of dry beans or rice, or slightly freezer-burned vegetables—nothing spoiled or nasty. 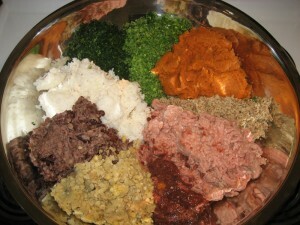 Take a look in your pantry & freezer and see what your dog would like in some meatloaf. In a large bowl, combine dry ingredients. Roughly puree wet ingredients like beans, rice, vegetables, etc. In another large bowl, combine wet ingredients. I put on latex gloves and mix with my hands. 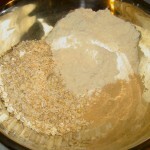 Add the dry ingredients and make sure it’s very thoroughly mixed. Add liquid as needed to get the mixture to form a thick, gloppy texture. 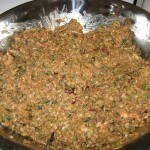 The mixture should be uniform in texture—no clumps of dry ingredients and no runny bits. Spread into greased baking pans and cook at 350°F for about 1 hour. It may take longer if your mixture was very wet. You want the loaf to be pretty solid so the slices won’t crumble and fall apart. Remove pan and allow to cool. I cut mine while it’s still in the pan. 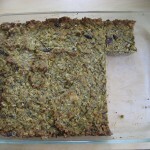 Place slice in empty pan or on a cookie sheet and freeze. I store mine in double ziploc bags and thaw a slice in the microwave as needed. I crumble it up, add a little water, and mix it in with Saffron’s kibble. I had to bag it and trash it so the fungus wouldn’t continue to spread. So much for tomatoes this year.